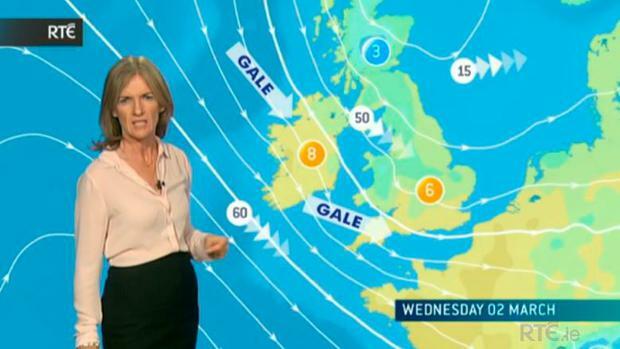 Viewers of RTE One's 9 O'Clock News were last night surprised by the arrival of a new weather woman presenting on behalf of Met Éireann. Expecting to see Jean Byrne, they were instead greeted by the lovely Joanna Donnelly, who delivered a concise, clear broadcast with the authority of a woman who certainly knows her isobars from her altimeters. Reaction to Joanna's arrival on Twitter ranged from surprise to confusion to admiration. "Jaysus!! Joanna Donnelly gave me chills doing the weather. #newgirlontheblock #rte #rteweather" tweeted Ciara O'Halloran. Conor Feehan, meanwhile, commented, "A new RTE weather presenter??? Without any warning whatsoever!!! @MetEireann"
Ken McFadden was a fan, "I like this new weather lady #rteweather #rtenews - just saying". Many viewers assumed Joanna was a newbie but she's a Met Éireann meteorologist whose voice will be recognisable to RTE radio fans and she has now joined the regular weather presenter roster at RTÉ Weather. She's also married to Harm Luijkx, another Met Éireann forecaster also familiar to listeners and viewers of both RTE radio and television. #rteweather New weather presenter Hallelluia! Great relaxed presentation, makes a change from the usual gulping and nervousness! New weather woman on #rte ..Not sure what to make of her! Hrm, new #rteweather presenter, same old weather though.